It's been a busy month! At last on a Bank Holiday Monday I've managed to take a moment to stop and write about a book I mentioned back in March. The Fringe Hours by Jessica N Turner, is a book that I hugely enjoyed, so much so I re-read it again over the past few weeks. I've found this book a guiding hand in helping me make the most of my time. I'm someone who has been using my spare time reasonably well for a while but I am always looking to mix things up and find new ideas, The Fringe Hours has helped me do just that. The Fringe Hours is about how to find time in the day to do things that you love and how we should focus more time on self-care. The book is based on Jessica's research collated from over 2000 surveys completed by women. It's a collection of ideas, thoughts and quotes from women showing how they feel about needing time for themselves and how they are using their fringe hours. Using themes from her research and her own methods of finding time, Jessica has written a book that is divided into four parts - Explore, Discover, Maximise and Live Well. The sections work through a set of stages. Firstly exploring why women don’t tend to prioritise self-care, then discovering what we most want to do in our fringe hours, how to find where the fringe hours are within our own lives, how we can work more activities into our day, and finally how to live a more meaningful and well rounded life using our fringe hours. On reading this I felt a rush of warm positive feelings and it made me really see the benefits of taking the time to pursue my passions. Throughout each section of the book there are questions that encourage personal reflection. When I reached these sections I sat and thought about my answers to the questions posed, sometimes taking a minute or two and others thinking more deeply. The chapters are a good length and suited to picking the book up when you can. I read mine on my commute and when I came home from work, both small chunks of time (my fringe hours!) and getting through the book at some pace. Over the past few years I've spent time reflecting and have taken time to work through a lot of the concepts covered in the book, mainly about how I wanted to use my spare time and where to invest my energy. The questions in The Fringe Hours provide a really good starting point to enable you to focus on your own thoughts and feelings about your spare time and attitudes, helping you to find your own answers. I felt a real connection to this book and maybe deep down it is a book that I wished I'd written. I discovered my fringe hours a while ago, fitting in listening to podcasts on my commute to work, finding time to read the many magazines I subscribed to, breaking things down into mini goals, having numerous hobbies and interests, and deciding to create smaller projects to pick up and put down when I fancied. Before I read this book I knew that I needed to find a way to look at my spare time in a different way and to try and fit more in. What helped me whilst reading the book is how much of a connection I felt to the author. Jessica scrapbooks, reads magazines, crafts and seems to be really busy, however she has found ways to fit things into her day in small chunks to use the most of time. However a key difference is that she is a parent. Initially I wondered if this book was going to be just for women with children but the way that it's written is suitable for all women and suitable for non-parents like myself. The main focus of the book about investing more time on self-care resonates with everyone, and the book really allows you to think about how you can be doing more of what you love. There are parts of the book I feel close to and other areas that don't quite resonate with my life, however overall this book was a boost that I needed to focus once again on my fringe hours. The Fringe Hours has made me want to press forward with my goals even more (take a look here if you'd like to read about them). I've recently been looking at my routines and I've started a refreshed journey of how I can use my fringe hours even more effectively to make more time for living a happy and creative life. It's pushed me to start putting my plans into place, making time to action some of the steps needed to move forwards in my life and complete a few things on my to do list each week. The Fringe Hours is a truly practical, down to earth and honest read. I really adored it and I'd highly recommend it. 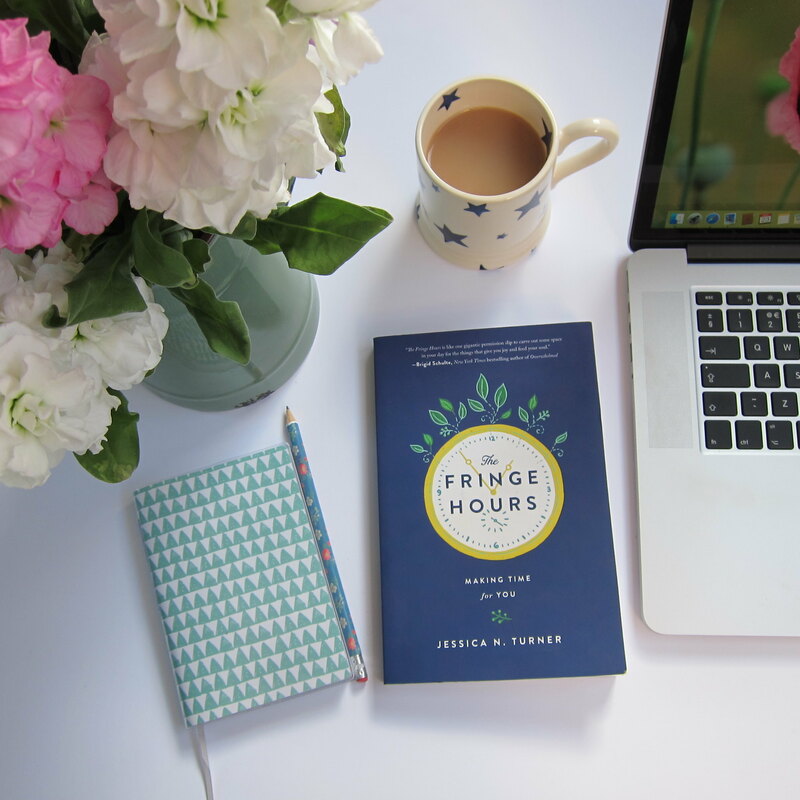 The Fringe Hours feels like a book that I will always have around on standby to lend to friends, or to be near my bed when I need a motivational push and ideas to help me focus on fitting in more time for the things I love.